This was the first Heritage Site to receive an Allen Heritage Award. 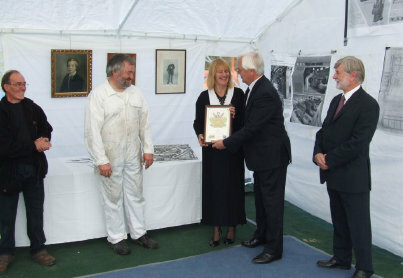 The Heritage Award Certificate was presented to Hazel Evans by David Allen, great grandson of William Henry Allen, on behalf of the Association on 10th October 2010 in recognition of their outstanding preservation work. David was supported by Colin Embley. The Museum aims to keep the power equipment in its original presentation and in working order. The Museum has 9 Allen Diesel Engines, most are installed and in working condition. Installation of the remainder is being planned. The oldest is a 1926 Allen 2-stroke semi-diesel (installed with Allen switchgear and in working order) originally supplied to Conington Fen Pumping Station and the youngest an Allen 6VS12G (1980) an ex-development engine. This Museum, situated at Tanygroes, a few miles north of Cardigan in Wales, was established in 2003 by Paul and Hazel Evans, moving their large collection of engines there from the Isle of Man. Power equipment is run most days during the season, and there are special ‘crank-up’ days which are always well attended. Current information including details of the Allen power equipment can be found on their website – wisit them by clicking the banner below. Investigate suspect worn piston rings in an 8S30 (1941) – Piston withdrawn and found to be close to catastrophic failure following seizure during its pre-museum life. Assist with the removal of an 6S37C (1948) from Welches Dam pumping station and its installation at the museum.